Classic-literature-adaptation demureness...but it's impeccably cast and mostly quite faithful. 115 min. Metro-Goldwyn-Mayer Pictures. Director: Gary Sinise. Cast: John Malkovich, Gary Sinise, Ray Walston, Sherilyn Fenn, Joe Morton, Casey Siemaszko, John Terry, Noble Willingham, Richard Riehle, Alexis Arquette. In 1936, John Steinbeck wrote to his agents, "The work I am doing now is neither a novel nor a play but is a kind of playable novel." And so it was that the novella Of Mice and Men was published February 25, 1937 and already on stage (at the Theatre Union of San Francisco) by May 21, 1937, before a playscript had been penned specifically for the stage. By November 23 of that same year, an official adaptation by George S. Kaufman (penned with the epistolary input of Steinbeck), opened on Broadway. It took two more years to get a film version into movie theaters (Lewis Milestone's classic starring Lon Chaney, Jr. as Lennie and Burgess Meredith as George); telefilms followed in 1968 (with Nicol Williamson and George Segal) and 1981 (with Randy Quaid and Robert Blake). But the version that remains most celebrated is the Palme d'Or-nominated 1992 film by Gary Sinise. Maybe that's because Sinise and co-star John Malkovich had played George and Lennie on stage in 1980 at the Steppenwolf Theatre Company, where Sinise was a founding member. And although the script was penned by a screenwriter at least as well known for his playwriting (Pulitzer Prize and Oscar winner Horton Foote), the deep-set theatrical roots of Of Mice and Men don't make Sinise's film feel in the least bit stagy. 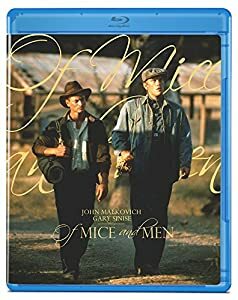 If anything, this version of Of Mice and Men could benefit from a slightly more lively take on the material, but it's impeccably cast and mostly quite faithful. Migrant workers George Milton and Lennie Small make for a study in contrasts as well as a symbiotic pairing. Steinbeck describes George as "small and quick, dark of face, with restless eyes and sharp, strong features" and Lennie as "a huge man, shapeless of face, with large, pale eyes, and wide, sloping shoulders." In addition to being good physical matches, Sinise captures George's coiled intensity (if softening his hot temper), and Malkovich ably inhabits the childlike quality of Lennie's mental challenge. Add Ray Walston as old swamper Candy, Casey Siemaszko as pugnacious Curley, Sherilyn Fenn (Twin Peaks' Audrey Horne) as Curley's Wife, and Joe Morton as stable buck Crooks, and you have yourself the makings of a fine ensemble. Of Mice and Men is about faint hopes and dashed dreams (hence the title, derived from Robert Burns' "To a Mouse"). Sinise somewhat underplays this theme, excising the novel's sad final page ("Now what the hell ya suppose is eatin' them two guys") and giving no weight to the ranchers' thrilling discovery that former rancher Bill Tenner got his letter to the editor published in a pulp magazine, as Tenner promised. Sinise's focus rests more with the story's characterization of George and Lennie, and the tragic punch of a handful of key events. The story's racism, sexism, and ageism also feel a bit undernourished, contributing to the film's classic-literature-adaptation demureness: the film misses the opportunity to evoke the backbreaking labor of today's migrant work, instead presenting a day's work bucking barley in a sunny, oddly cheery montage (Mark Isham's score never quite gels to the material, either). For all these micro-frustrations, Sinise's Of Mice and Men successfully tells its story in broad strokes and cinematic terms, serving as a prime vehicle for actors. Of Mice and Men is about as close as we get to American Shakespeare: it's deathless material, as proven by the 2014 Broadway revival (also recorded for special movie-theatrical exhibition) starring James Franco and Chris O'Dowd as George and Lennie. Perhaps that duo will commit their performances to a full-fledged film production, but until then, many a student studying (though not necessarily reading) Of Mice and Men will think of Sinise and Malkovich as their George and Lennie. Olive Films does a fine job of bringing Of Mice and Men to Blu-ray. The transfer looks good, despite probably dating back to 2001 (a bit of telecine wobble makes for a dead giveaway). Detail and texture are substantial, and there's no mistaking this photography for digital, given the preservation of film grain. Shadow detail isn't great, and color doesn't appear to be wholly true (flesh tones tend to red), but all around, we see a significant and very welcome improvement over the standard-def DVDs. The DTS-HD Master Audio 2.0 soundtrack can be considered definitive, maximizing the dialogue and music within the range of a stereo mix. Happily, Olive retains all of the bonus features from MGM's 2003 Special Edition Blu-ray, beginning with a historically valuable feature commentary with Director Gary Sinise, in which the director discusses his personal history with the material, as well as his approach to filming it. Even more interesting is the interview featurette "In Conversation with Director Gary Sinise and Screenwriter Horton Foote" (27:15, HD), which finds Sinise essentially interviewing his storied screenwriter. "Making Of Mice and Men" (6:01, HD) is an EPK-style featurette with some B-roll from the set as well as film and interview clips. Eleven "Deleted Scenes" (18:44, HD) come with optional commentary by Sinise. We also get "Makeup Tests for the Main Characters" (11:48, HD) and a "Sherilyn Fenn Screen Test" (7:46, HD) of the barn scene with Sinise, with multiple takes shot from different angles. Rounding out the disc is the film's "Theatrical Trailer" (2:16, HD). All site content © 2000-2019 Peter Canavese. Page generated at 04/26/2019 07:34:02AM.